Can you get more out of a cheap motor? Application designers are always looking for ways to expand their capabilities and reduce design challenges. Angle position sensors have become increasingly popular for providing these objectives in the design process. Ryan Eder from CHERRY Industrial Solutions runs us through the basics. There's a new kind of piezo motor in town, and it's got legs. The Piezo LEGS® rotational motor is a direct-friction drive that provides precise motion without any mechanical play or backlash. There are no gears or transmission, so changing the direction of the motion will introduce no error. The simple Piezo LEGS® motor is also extremely stiff. 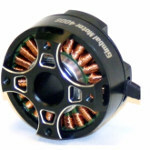 Find out the answers to frequently asked questions about this exciting new motor technology. When Don Hall saw a robot arm made of balloons while visiting Carnegie Mellon University's Robotics Institute several years ago, he knew instantly that Baymax, a pivotal character in the animated feature he was co-directing for Disney, had to be an inflatable robot. Current space propulsion systems based on rocket technology alone place limits on the performance of launch vehicles, which leads to multistage vehicle configurations that are either expendable or only partly reusable. This results in complex launch systems that are both high maintenance and expensive to operate. REL's Skylon space plane, a fully reusable single-stage launch vehicle, addresses these drawbacks and could revolutionize future access to space by providing more efficient and reliable launch operations. Michael Hood of Reaction Engines Ltd. talks about developing and testing the Skylon Mach 25 engines. Engineers at Adams Golf talk about the reasoning behind their development of the company's successful Speedline driver line and how using NX Flow software from Siemens PLM Software in new-generation models has changed their engineering game and radically sped up their time to market. It's easy to change the phase relationship of a drive component and the shaft with a Phas-Lok from Zero-Max. Designed to reduce system downtime, these labor-saving devices eliminate the need to disconnect or remove drive components in order to reposition or re-synchronize them. They provide an accurate, mechanical adjustment with a 24-degree range (+/- 12 degrees) and compensate for required timing changes in a power transmission system. When mounted in a system, the Phas-Lok acts as a dependable position control device. 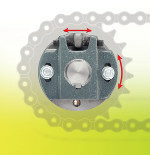 It is ideal for fine-tuning timing adjustments, including adjusting for chain elongation and sprocket tooth wear. Available in three sizes. The ErgoSwiss TQ System is perfect for desks and workstations, assembly and folding tables, kitchen counter tops, sinks and cabinets, displays, flow hoods, abrasive blast cabinets, biological cabinets, fume hoods, and conveyors. The TQ leg has an extruded aluminum profile with a stainless steel tube mounted inside. 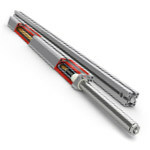 The lifting movement is provided by hydraulic cylinders. The 8-mm-wide T-Slots allow interim shelves, fittings, and attachments to be fitted the whole length of the table leg. The system is available in single parts or as a complete sub-frame. It is adjusted using a hydraulic pump with a hand crank or an electric drive. Available from American Sales Development. GAM's new Sizing Tool makes it easy to find the right gear reducer, coupling, or linear mount product compatible with your motor. Simply select your motor, adjust the ratings based on the application, and narrow down the products that match. 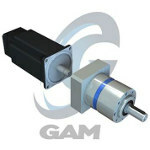 Over 9,000 of the most popular servomotors on the market are available for selection. After choosing a motor, easily narrow down the list of matching products by filtering attributes. What if you could run your multiphysics simulations as specialized applications? Now you can. Included in COMSOL Multiphysics when you update to version 5.0 is the Application Builder, which lets you build applications based on your COMSOL Multiphysics models. Applications enable accessing models with specialized and intuitive user interfaces that can be used by anyone throughout your organization, leveraging your simulation expertise and providing far greater access to the power of COMSOL Multiphysics. 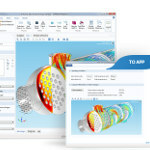 Your apps can include any physics and multiphysics combinations from the COMSOL product suite for mechanical, electrical, fluid, and chemical simulations. The head of the F-35 Lightning II joint strike fighter program office said Oct. 30 that he expects to have decided on a permanent solution by the end of December for the design issue that caused an engine to fail in June in an F-35A at Eglin Air Force Base in Florida. The engine's manufacturer, Pratt & Whitney, has offered several potential fixes; some are already being tested. The attendees at this year's Specialty Equipment Market Association (SEMA) Show (Nov. 4-7) were shocked when emcee Rutledge Wood lifted the Sleeper Camry's body to reveal a purpose-built dragster putting out over 850 horsepower. Scientists at Nanyang Technology University (NTU) in Singapore have developed ultra-fast charging batteries that can be recharged up to 70 percent in only two minutes. The new-generation batteries also have a long lifespan of over 20 years -- more than 10 times compared to existing lithium-ion batteries. When buying expensive motors, you typically pay for a more optimized design, higher quality materials, and higher quality manufacturing. Researchers at the University of Pennsylvania's MODLAB claim that you can compensate for the usual shortcomings of a cheap motor by mapping the motor's torque ripple and feeding in the inverse of this map to the motor's produced torque via software, making an anticogged motor. The torque ripple ratio is significantly decreased for the motor, and a cheap motor can now perform as good as an expensive one. What do you think? For the time being, we are sticking with, "You get what you pay for."